In an age where the mass populace is questioning rock ‘n’ roll’s legitimacy due to the mass proliferation of pop and due to hip-hop’s rise in record sales, bands like Black Rebel Motorcycle Club are still sticking around. The group from Los Angeles have always set themselves apart from their contemporaries with a leather-clad sound that fuses shoegaze, blues and punk together to create something infectious. Their eighth album, Wrong Creatures, is being released via Vagrant Records on Jan 12 and tbe aesthetic it conveys echoes the famous adage “If it ain’t broke, don’t fix it” that the band has followed for nearly 20 years. It’s a hypnotic rock record that’ll put the ears in a trance. There’s also a case to be made that this is the closest to a blues album the band has ever done. Like many bands, the trio of Robert Levon Been, Peter Hayes and Leah Shapiro went into the studio to capture Black Rebel Motorcycle Club’s live experience. Producer Nick Launay assisted in getting a clear and raw feel for what the band wanted to do. They achieved it by harnessing their unique energy and putting it into each track on Wrong Creatures, as the album examines death and historical narratives. It’s also apparent that both Been and Hayes are fighting and soothing something within themselves whenever they start singing. “Little Thing Gone Wild” is a raging track with a thunderous chorus; Shapiro’s drumming serves as a stellar foundation while Been and Hayes get loud and intense. The weirdest track on the album is definitely “Circus Bazooko” – there’s an organ that sounds reminiscent of a carnival game, while Hayes strums sweet licks on guitar. Leaning towards post-punk is “King of Bones” with steady rhythms and endless cool. 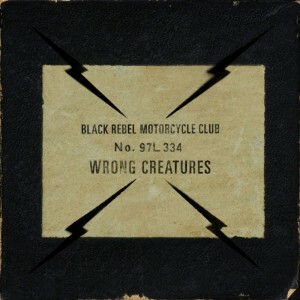 Black Rebel Motorcycle Club will be embarking on a tour in support of Wrong Creatures starting at the House of Blues in San Diego on Jan 15. Fans in New England can catch them at the Royale in Boston on Jan 31. Been, Hayes and Shapiro have forged a reputation for themselves being a must-see band live, so if they’re coming through your town then head on out to the show. While you’re there, grab a copy or the new album. It’s an innovative album with tons to offer while turning up the volume.